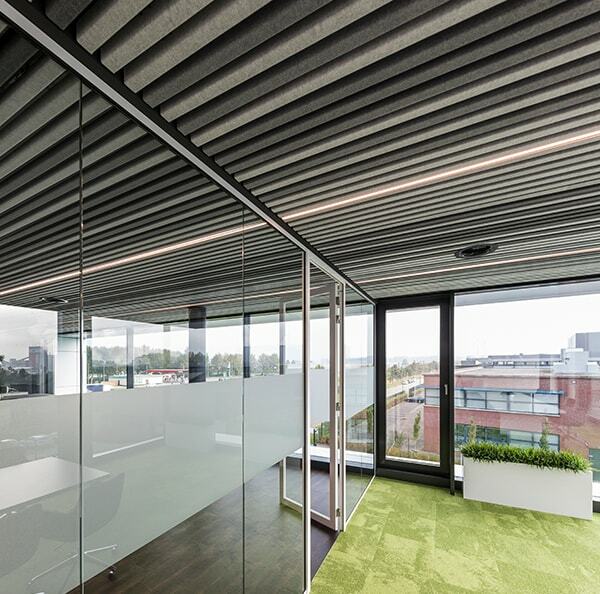 Our textile ceilings offer outstanding acoustics and a unique appearance, putting both comfort and aesthetics at the forefront. Our textile ceilings have sustainability at their core, and are 100% recyclable, as well as being easy to reuse. In particular, we utilise felt material to create stunning designs and fit for purpose ceilings that give outstanding acoustic and visual performance. Our HeartFelt® ceiling is the felt ceiling that had to made, for all these reasons and more. DID U KNOW ABOUT TECHSTYLE? Something you should know about this product, it is really green, not the color, the sustainability but you can order in green too if you want. Textile ceilings are a combination of precision engineering and strong design. Offering a clean look using materials that are both dirt and dust resistant. 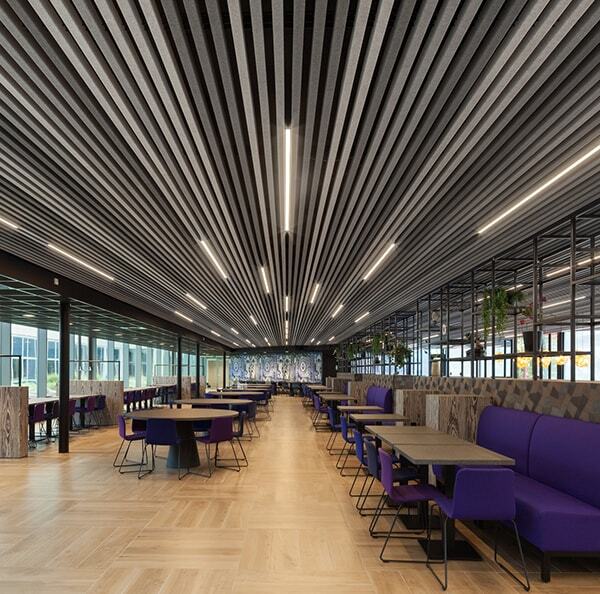 Felt ceilings are ideal for renovation projects and are particularly suited for a range of sectors including the hospitality, education and healthcare sectors. 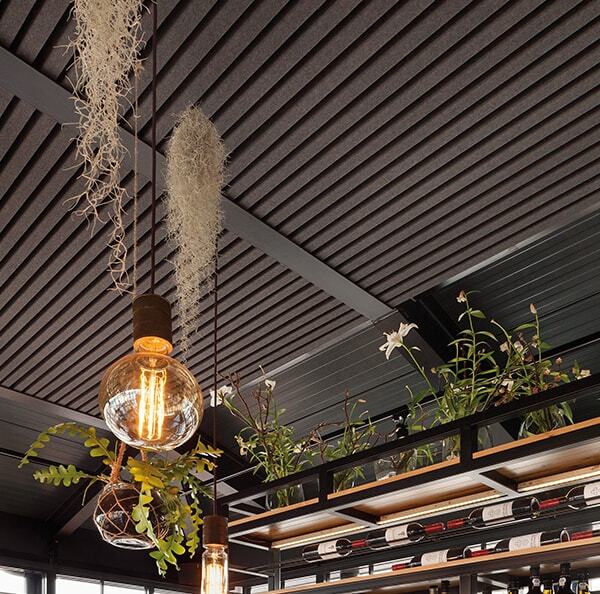 A felt ceiling is a stunning addition to any buildings interior. Our HeartFelt® ceiling is available in seven shades of grey, as well as five earth tones. This colour combination enables architects and designers to create a warm and soothing ambience to a rooms interior. Altering the panel height and spacing can have a major influence on both the aesthetic appearance and acoustic performance of the ceiling space. HeartFelt® panels can also be fixed to walls to create a continuous flow of textile appearance. This can add further warmth and sound absorption to a room or corridor where noise levels or an extra calming influence is required. Our HeartFelt® ceiling is currently available in 7 different shades of grey and 5 earth tones. This allows for a soft look and warm ambience that lends itself well to any interior area. Our focus on quality and sustainability (ISO9001 and ISO14001 certified) ensures the highest standard of production processes, material, machinery and finished product. The superior durability of Hunter Douglas products translates into lower costs during the life cycle of the product. 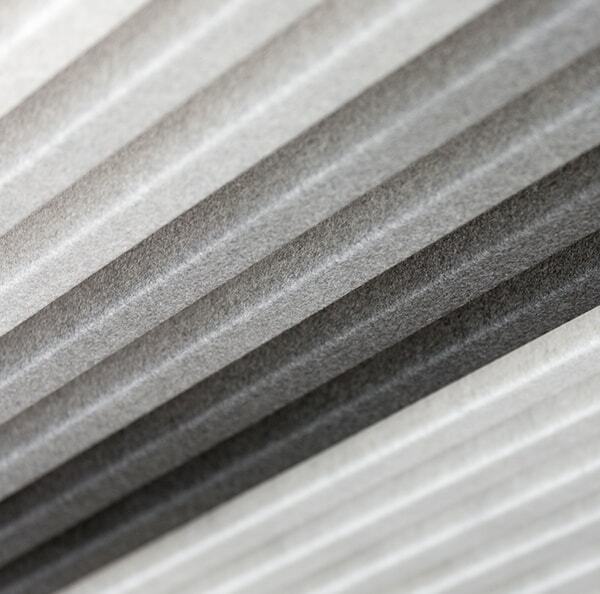 Textile ceilings are the ideal solution for environments where acoustic comfort is important. By altering the height of the panels and the width between the panels, the ceiling can offer the most ideal acoustic performance for the space. Acoustic comfort is particularly important in large and busy areas where noise levels can be particularly high. Felt ceilings work to reduce echo and as such, improve the acoustic comfort of the area. Failure to have an acoustic ceiling could lead to hearing damage if people are frequently exposed to the area for long periods of time. Be inspired by our project gallery with interior metal ceilings. Click on the photo for more information. Use the filters below to browse our full selection of Textile Products.